It happens to everyone from time to time. You are in a store or shopping online, spot something that interests you, and almost immediately that item turns into something that you can’t do without. Are you prone to buying things on a whim? Do you often make purchases you didn’t plan to make? Do you have trouble resisting a great buy or maybe a not-so-great buy for an item you really don’t need? Do you have a problem with impulse buying? Here are three questions you should ask yourself. Did you answer “yes” to these questions? If so, you could be an impulse buyer. It can be thrilling and fun to buy something new or score an incredible deal on an item that is not on your shopping list. Unfortunately those “must have” buys can wreak havoc on your budget. According to a recent CNBC report, the average U.S. consumer spends up to $5,400 a year on impulse purchases. The biggest impulse buy? More than 70% of respondents in a survey by Slickdeals.net stated that food headed the list, with clothing, household supplies, takeout food and shoes rounding out the top five. 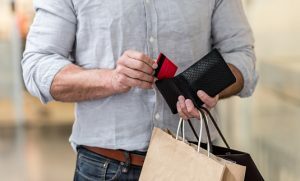 For people who are in debt and rely on credit cards to pay for unplanned purchases or who don’t have enough in savings, impulse buying can lead to big financial problems. When you shop with cash you have a limited amount of money to spend. Plus, seeing your actual dollars disappearing can be an effective deterrent against overspending. Carry only one credit card to use in an emergency only, for example, if your car breaks down on your way home. A shopping spree may temporarily lift a bad or sad mood, but the happiness can be short-lived. You may end up with things you don’t need and not have enough money left to buy the things you do need. Plus, if you pay with credit cards, you may also end up in higher debt. Fulfilling an emotional need with impulse purchases can leave you with buyer’s remorse which can make you feel worse. Don’t go shopping hungry. Hunger can trigger the urge to buy more at any store- not just at the supermarket. Marketers know how to capture your attention in your email inbox. By unsubscribing to retail mailing lists you’ll reduce the temptation to redeem all those promo codes and “limited time” offers. If you receive catalogs in the mail, request to be taken off of those mailing lists as well. See something that’s tempting your heart and your wallet? Prior to making a purchase, assess if the item is something you really need or something you just want. If you still think you need the item, wait 24 hours. If you are shopping online, put the item in your cart but don’t make the purchase. At a brick-and-mortar store you can ask if they will hold the item for you for a day or two. This will give you some time to reconsider your possible purchase. Shopping with friends can be a blast but not when it breaks your budget. Avoid using shopping as a social activity, especially if your friends are also impulse buyers. It’s all too easy to encourage each other that you all “must buy” that perfect outfit or the latest tech product. Find fun and frugal activities that are not centered around a shopping trip. A little trick you can use to dissuade yourself from making an impulse purchase is to determine how many hours you would have to work to pay for the item. For example, if something is $200, how many hours of work would it take you to be able to cover that amount? How many hours of use or enjoyment will you get out of that item? Is it worth it? Whether you are grocery shopping or heading to a big box store, write a list of exactly what you need. Businesses love impulse buyers and they do everything they can to entice you to spend more. Stay focused! Establish a splurge budget so that you’ll have some “fun funds.” Put aside a small amount of money from each paycheck so that you have some discretionary cash to spend on those non-essential expenses. Whether you want to dine at an upscale restaurant or bring home a new pair of designer shoes, a splurge budget will allow you to spend responsibly. Whenever you are tempted to make a last-minute purchase, try to remember your long-term financial goals. Use these tips to help regain control of your spending and break the impulse shopping habit.